Is Litz Wire Right For Your Application? With the ever-changing and advancement of technologies in the design and development of power electronics and the shift to higher operating frequencies, litz wire has become a primary element engineers across all industries are relying upon to produce smaller components that are meeting higher and higher energy efficiency requirements. To know if litz wire, or simply litz, may be the right type of conductor for your winding, we need to understand what litz is and how it works. 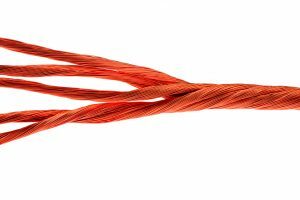 Litz wires are manufactured by twisting or weaving individually insulated conductors, typically enameled copper or aluminum magnet wires, in specific patterns which allow each individual wire, or strand, the opportunity to appear anywhere along the cross-section of the twisted conductor. By twisting and weaving the individual strands of magnet wire in these patterns, litz help reduce winding losses caused by both skin effect and proximity effect. Skin effect is the tendency when employing alternating current for the electrons to flow only on the outer edge of the conductor and therefore greatly increasing the AC resistance of the conductor. This can be greatly reduced by evaluating the frequency range at which the winding will be operating and selecting the individual wire diameter accordingly. Proximity effect is the tendency for current to flow in undesired patterns due to the presence of magnetic fields generated by other nearby conductors or turns on a winding. While not yet fully understood, to limit proximity effect within the litz conductor the patterns in which the individual wires are twisted or woven help to further reduce the resistive losses within the winding. In practical terms, the use of litz wire has been found to be a useful tool when designing wound components that operate from about 10 kHz up to 3 MHz. Below 10 kHz and above 3 MHz, the price vs. performance evaluations tend to favor other winding methods such as employing flat, edge wound conductors or evaluating foil based winding techniques. One challenge to keep in mind when looking to design with litz wire is that the diameter of the twisted construction will be significantly larger than the diameter of a solid conductor of the same copper area. Due to the increased diameter, which can be in excess of 15% larger than a comparable solid conductor, the total number of turns and layers within the winding window as well as the copper fill factor must be evaluated carefully. As a manufacturer of litz conductors, we are constantly asked “What is the best litz wire for my application?”. There is only one answer to that type of question – “It depends.”. There are many more variables to design a litz conductor. We have found that a good starting point for helping you design an effective litz conductor is the process proposed in “Simplified Design Method for Litz Wire”, by C.R. Sullivan and R. Y. Zhang that was presented at the 2014 IEEE Applied Power Electronics Conference. In their paper they provide a methodology that incorporates not only the operating frequency and current, but also the overall winding window area and number of turns. Once you have evaluated your winding and have determined the nominal litz design for your application, the next step is to contact us. Rubadue Wire understands the needs for prototyping and can support your requirements for a wide variety of litz options from small quantities to full scale production. Click here to read the article mentioned above.